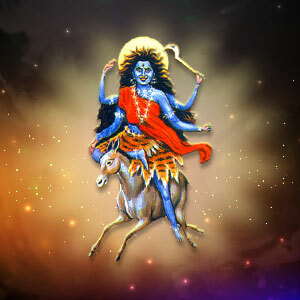 Kalaratri puja is performed for attaining power, wealth and eminent status on earth. Offer Water and Flowers *(Red Champa) to Mata Kalaratri seeking blessings for the good health of self and dear ones. Offer flower, dhoop, etc to the idol of the Goddess. Offer bhog or fruits to Mata Kalaratri as per your capacity. After performing puja pay your respect to the elders of the house and distribute Prasad.